This modern-day Stonehenge is Marina Bay Sands in Singapore. It was billed as the worlds most expensive casino property at $8,000,000,000 in 2009. Ambitious? Certainly, The record-breaking 67-metre overhang and 150-metre infinity pool presented some unique challenges, not least construction during the GFC. Extravagant? Definitely, but ask yourself how green our cities would be if every building had a 3-acre park on it’s roof. I wonder if bees ever fly up the 55 stories to visit it’s 650 plants and 250 trees? 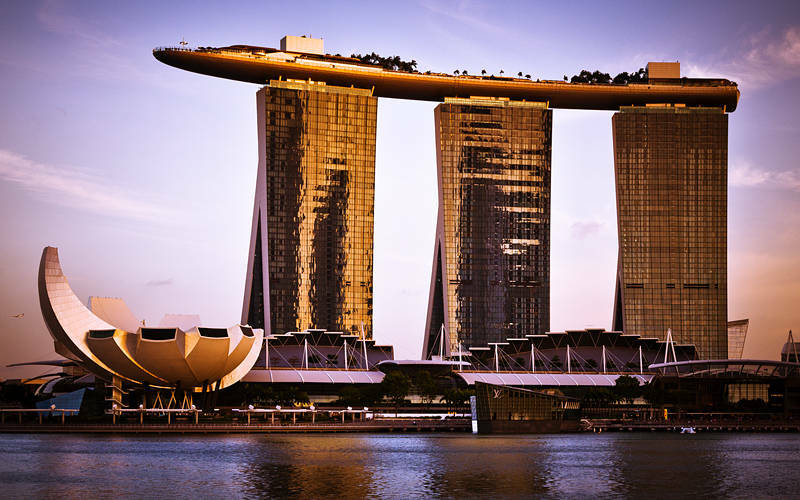 If you find yourself on a long-haul layover in Singapore the airport run free city tours. This evening shot is the result of a pause in a Journey from Australia to the UK. I suggest you take a tripod on the later tour so you can get a night shot with all the lights on. This shot from the 6pm tour needed some Photoshop to add some depth to the colours. Thanks to Don at “The World is Flat” for helping me get onto Changi airports WiFi. Magnificent. Did you process it in the terminal? Hope you didn’t miss your flight? Thanks, Processed in a bar in the terminal while waiting for next flight.